Tremiti Islands is an archipelago composed of five small islands and is located just 20 km from the Northern coast of Gargano. 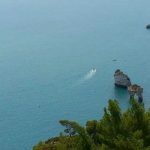 The five islands are: St. Nicholas (San Nicola), St. Domino, Capraia, Cretaccio and the farthest out, Pianosa; from an administrative point of view they belong to the Foggia Province and are also part of the Gargano National Park. The archipelago was originally named Insulae Diomedae in honor of Greek hero Diomede, which as the story goes, founded the archipelago and was buried on one of the islands. 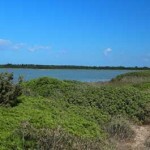 Tremiti Islands are accessible by boat from Rodi Garganico, Peschici, Vieste, Manfredonia and by helicopter from Foggia. Most boats arrive at St. Domino and small boats regularly make the brief crossing to St. Nicola. The archipelago is a jewel, literally a pearl in the Adriatic Sea, and makes for a splendid trip. The hour-long boat ride takes you to a world of raggedy cliffs, sandy coves and thick pine woods, surrounded by the cobalt-blue sea. Pretty deserted during winter months they become very crowded in summer when some 100,000 tourists descend on the archipelago. This is due mainly to its natural beauty, history, nature, sunshine and sparkling blue waters, all within a national marine park. The crystalline waters and the splendid backdrops recall many tourists, attracted by the possibility of diving and underwater fishing where permitted. This is a wonderful destination for a day trip, or even better a relaxing extended holiday. St. Nicholas is the second largest inhabited island, it is also the heart of the archipelago. In fact it has always been the historical, religious and administrative center of the entire archipelago. Inhabited by monks since ancient times, it was a refuge for hermits and was also a penal colony. In the past it has also been used as the main defence against intruders, with its high walls and fortifications perched at the top of the island. From a historical point of view there are large tracks of the past, among these we recall the castle like cluster of medieval buildings which rises up from the rocks, churches and fortifications walls. The Santa Maria a Mare Abbey which was founded in 1045. It guards a wooden cross (the only Greek Byzantine found in Italy) and its floor is made of a huge mosaic dating from the eleventh century. Its rocky coastline is dotted with dramatic caves and beaches, some of which can be reached by steep paths and others only by boat. St. Domino island is the largest and most beautiful from a scenic point of view. 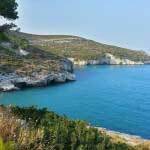 Its coastline is characterized by the presence of several caves: Bue Marino cave, Murene cave, Viole cave, Sale cave. Not to be missed is a boat trip to the Rondinelle and Coccodrillo caves. Entirely covered with the beautiful coastal pines, thanks to its breathtaking seabed, the waters clear, cliffs and beaches this island is the main tourist destination in the archipelago as it is the most equipped in terms of tourism facilities. It offers a port, heliport, and a large number of hotels, restaurants, holiday villages, camp-sites and diving centers. Capraia is the second island in order of extension and is absolutely wild and uninhabited. This island is a favourite destination for scuba diving, among other excursions you can visit the wreck of the Roman ship Three Senghe dating back to the second century BC. The extraordinary clarity and color of its waters allow visitors to admire through the depths some of the most colorful sponges, annelids, curly fans and marine stars. Pianosa is a deserted island and is barely more than an out-cropping of rocks but has extraordinary environmental importance and is one of the most protected under the Marine Reserve established in 1989 to preserve the exceptional variety of underwater plant life. Bathing, boating, and fishing are virtually impossible here. In addition to being abundant with sea-life, the waters around the island also gives up fragments of ceramics and Roman amphorae, resulting from the Roman ships that sailed its seas. Cretaccio is simply a large rock and is uninhabited, according to legend it is populated by ghosts. As the legend goes, a prisoner was executed on this island, and his ghost still now lives there, holding his head in his hands. To enrich the”thrill” contributes to the nearby rock La Vecchia, a dark black, owned by an old witch.